I developed this Vanilla Oats with Coffee Syrup and Berries recipe for Vega-licious and can now share it here. 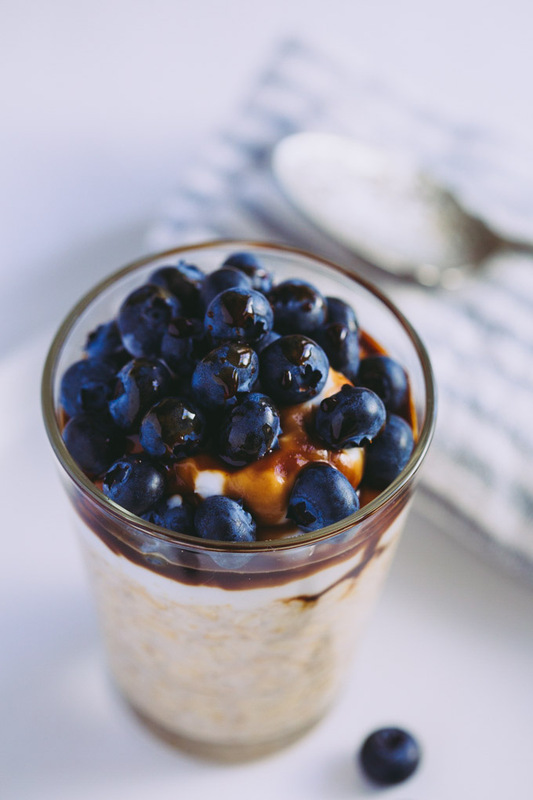 Gorgeous creamy vanilla overnight oats with deep coffee syrup and bursts of acidic blueberries. Hello breakfast. With an easy ratio of 1:1, one part oats to one part liquid, overnight oats could not be simpler. Our house is not-so-veiled chaos in the morning with an early rising elf and Great Dane pup eager to begin their day. I would love to say I am the jump-out-of-bed-with-a-spring kind of gal, but I am more a muddle-through-with-a-giant-coffee-clutched-in-my-fingers type. Jar oats or overnight oats are super easy to prepare the night before and work with pretty much any topping you like. Great for those slow to come out of first gear. These vanilla oats with coffee syrup and berries are my little treat to myself with a good dose of sweet, rich, brewed coffee reduction. 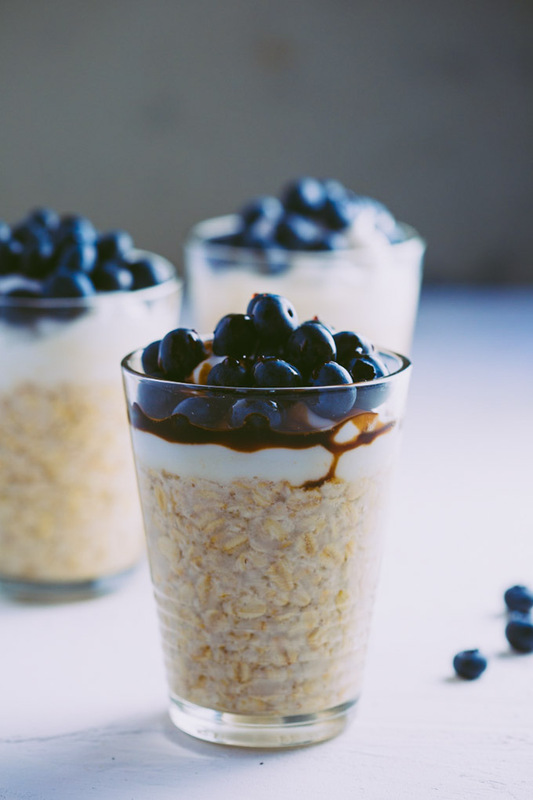 Vanilla oats with fresh blueberries, or any berries, works great for kids and busy mornings but on those days when you have an extra five minutes the coffee syrup makes a simple breakfast, special. These oats are a great alternative to a cooked breakfast or brunch; they bring the wow factor without the effort. With a wonderful balance of flavours, the end product completely belies how simple the recipe is. I love how each mouthful is loaded with distinct but complementary flavours. 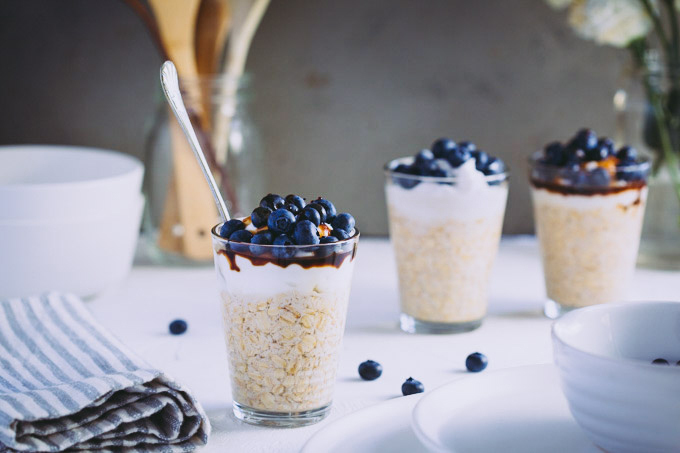 First a hit of sweet coffee followed by the acidic burst of blueberries and creamy coconut yoghurt all brought together by simple vanilla oats. My kind of breakfast. Enjoy. 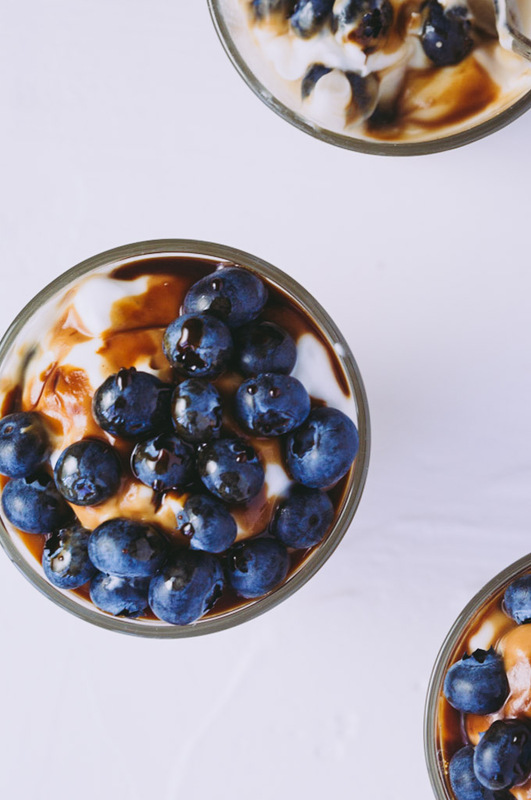 Creamy vanilla overnight oats with deep coffee & bursts of acidic blueberries, vanilla oats with coffee syrup and berries is brunch made delicious and easy. In a medium bowl whisk together the almond milk, vanilla and maple syrup. 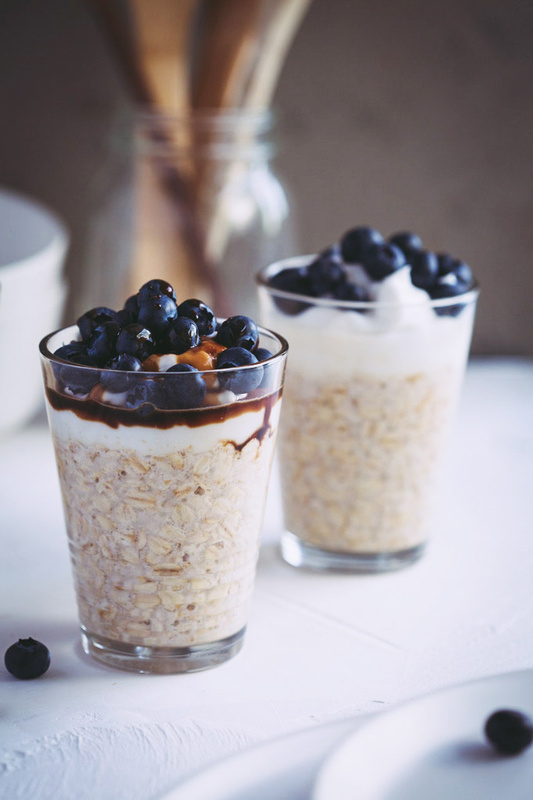 Place 1/2 cup rolled oats in three individual glasses. Carefully pour 1/2 cup of the almond milk mixture over the oats. Before serving, put the fresh coffee and maple syrup in a small saucepan and bring to a soft boil over medium heat. Lower the heat to low and simmer for 5 minutes. Add the coconut sugar and continue simmering until the brew has reduced by half. Take off the heat and allow to cool. The syrup will thicken while cooling. To serve, dollop coconut yogurt on each serve of oats. Sprinkle liberally with fresh blueberries and drizzle coffee syrup over the top. Can you post this recipe on your website? The link to vega-licious is not working. Their recipe page was supposed to be updated by Jan 2018. Considering it is March now, I’m guessing their project was derailed. Of course, Miju. It is up on the page now. Sorry about that. I didn’t realise the link was void. Thanks so much for letting me know. Such an interesting recipe–I love the idea of a coffee syrup! Thanks so much for sharing, I’ll definitely have to try it! Thanks so much Tisha. I do love my coffee and it works beautifully with blueberries. Thanks so much Michelle. Me too!